Ubiquitous and pervasive computing first identified the emerging challenges of studying technology used on-the-move and in widely varied contexts. With IoT, previously sporadic experiences are interconnected across time and space. This increasing complexity has multiplied the challenges facing those who study human experience to inform design. 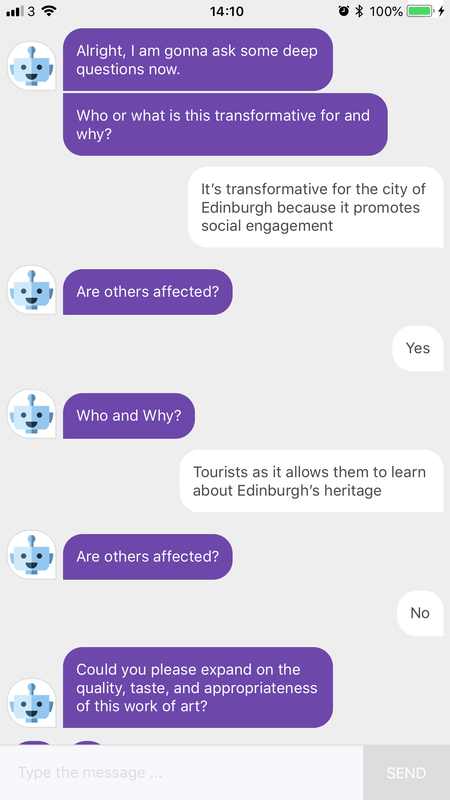 The use of a chatbot or ‘Ethnobot’ to gather ethnographic data, and considers the opportunities and challenges in collecting this data in the absence of a human ethnographer. This subsequent study involved 16 participants gathering information about their views, thoughts & implications of public art in Edinburgh. This qualitative data is then exported to a Data Visualisation tool for review by a human ethnographer.